LOOK: Awra Briguela Kisses Sue Ramirez on the Lips! Awra Briguela may be a homosexual, but that doesn’t stop him from having fun. 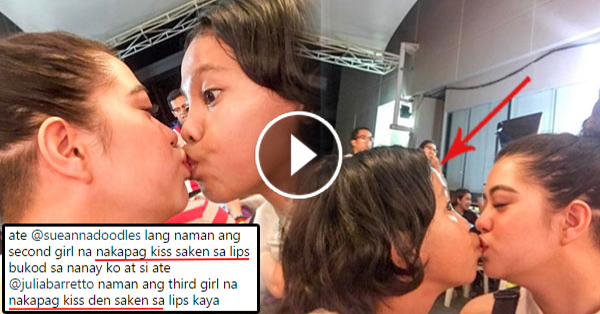 According to his own Instagram page, he kissed actress Sue Ramirez on the lips! Well, that was a long time ago, but according to him, Sue was the second girl that he has kissed on the lips, apart from his mom. Meanwhile, Julia Barretto was the third girl. Lots of netizens commented on the pic, as expected. After all, who else would be able to get away with kissing young, hot actresses on the lips? It was not known how and why Awra did such a thing but perhaps because he was just clearly having fun. He’s known to be extremely naughty and playful around fellow actors and judging from the pic, he’s getting it alright. What do you think about Awra kissing Sue? Do you want to kiss Sue too? Get in line.